EBU International Broadcasting Assembly meets in Paris. 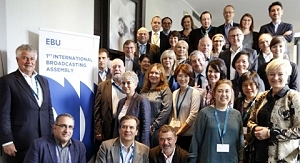 Paris, May 2016: Delegates from 22 European public broadcasters gathered in Paris on 19 and 20 May to discuss the unique challenges, issues and opportunities relating to broadcasting for worldwide audiences. Europe-based international public broadcasters offer independent news and current affairs and a great variety of programs in a wide range of languages which reach large audiences, including in countries where the freedom of media is weak or seriously endangered. As the first gathering of its kind, the Assembly hosted by France Médias Monde also elected a chairman as well as 8 committee members, whose role will be to set the priorities for discussions and set the agenda for future activities. The EBU International Broadcasting Assembly is open to all EBU Members, Associates and approved participants with international broadcasting activities in TV, radio and/or online. The Assembly integrates the EBU Bruges Group, which was founded in 1991 by six broadcasters (BBC, Deutsche Welle, 3sat, RAI, RTP and TV5), as well as the former EBU International Radio Group. This renewed commitment underlines the increasing importance of international broadcasting activities both for the EBU and its members.